(Newser) – A memo dated Nov. 7 out of the Office of the Attorney General appears to be Jeff Sessions' last hurrah, but civil rights advocates aren't applauding. 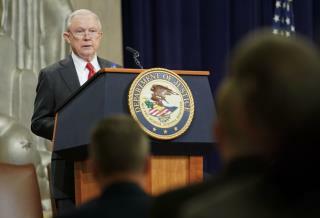 The New York Times reports that, before he left his post at President Trump's request, Sessions signed off on strict new guidelines around consent decrees, court-mandated contracts between the Department of Justice and local governments to revamp police departments hit with allegations regarding abuse and civil rights violations. Such agreements are already in place in cities such as Ferguson, Mo., as well as Chicago and Baltimore, with the latter previously drawing the ire of Sessions, who said the city was "one of the most tragic examples" of how these decrees hamstring cops, per the Baltimore Sun. Sessions actually did something before he left? I must have missed it. He just couldn't resist making America just a little more worse before he goes. If you don't want to get hassled by cops, don't commit crimes, resist arrest and mouth off. It's that simple.